Fall is a busy season in the garden. In addition to harvesting in the fruit and vegetable gardens, we spend fall planting new borders, digging and dividing existing plants, and planting bulbs. 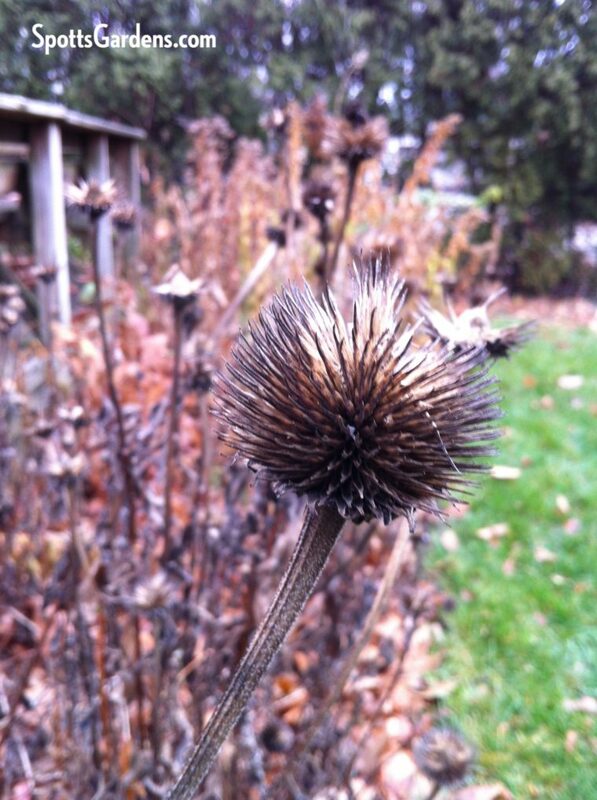 By the time mid-November comes around, we’re ready to start truly tucking the garden in for its wintery slumber. The final garden chore of the year is the fall garden cleanup. At one time, we would rush to cut down and haul away spent plants and fallen leaves. But we’ve learned that health of the garden depends on doing our fall garden cleanup in a smart, strategic way. We want to remove anything that may promote disease, but leave enough to shelter wildlife, protect plant crowns, and feed birds. With that in mind, here’s how we at Spotts Garden Service approach the fall cleanup. Remove and store man-made objects. Winter’s freeze-thaw cycle is hard on anything porous, like terra cotta pots, ceramic statuary, and birdbaths. While we like to leave some large pots out (wrapped against the cold and decorated with winter greens), anything prone to damage is removed from the garden and stored. In our own gardens, we put away outdoor furniture, scrub and store pots, and drain and store the garden hose. We also empty rain barrels and leave the spigot open—any water that gets in will drain out harmlessly. No matter how beautiful, don’t leave a thick layer of leaves on the lawn. Chip it with a mower instead. Remove fallen leaves from the borders. Tree leaves are a tricky proposition. We don’t want a mat of fallen leaves covering garden plants, because it could rot the crowns. On the other hand, insects may have begun hibernating in the leaves. Those leaves can also provide an excellent way to build soil, so we don’t want to haul them all away. We remove fallen leaves from borders, raking or blowing them into a nearby lawn. We then use a lawnmower to chip them, passing over them at least twice in different directions. The result is a finely chipped mix of leaves. If we have a very thick layer of leaf chips, we’ll remove some. But wherever possible, we return those chipped leaves to the borders, knowing that they won’t smother plants the way whole leaves might. We might also pile chipped leaves either to rot down into leaf mould or to add to the compost heap over the winter. No matter what you might read elsewhere, don’t leave whole leaves lying around in your beds and lawns. 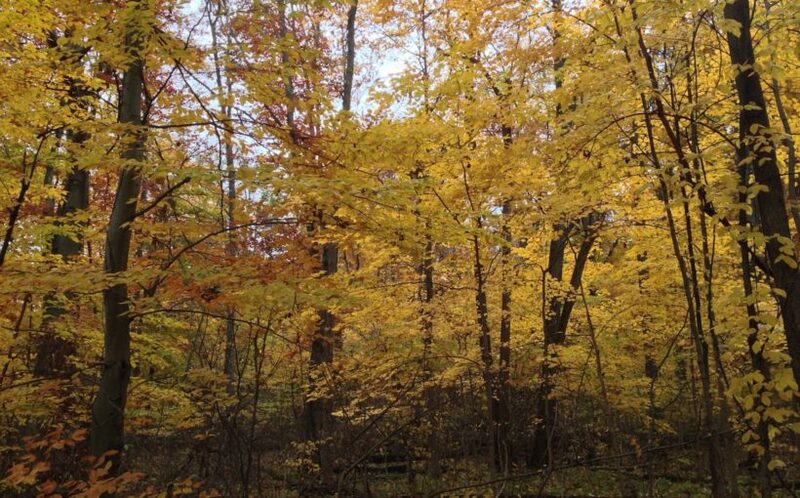 A layer of leaves right off the tree is fine in a woodland, but not in a lawn or garden. Leave up as much as you can. Many plants show green growth (basal leaves) this time of year, so we leave those alone. And if we really have to cut a flopping plant back, we leave a substantial part of the growth to cover the crown through the winter. We leave grasses standing through the winter to add structure and movement to the winter garden. They also provide food for seed-eating birds and shelter for a host of valuable insects. Flopping grasses can be encouraged to stand upright again by cutting a ring to about half-height around the outside of the grass. The stems of the short-cut grasses will hold up the tall grass stems in the middle. This border full of seed heads provides winter food and shelter to wildlife. We always remove any perennials that show signs of disease. Peony foliage should always be removed and thrown away (not composted) because it carries a fungal disease that can winter over. We also cut down and throw away the foliage of other plants with fungal issues, including rust-spotted hollyhocks and powdery mildew-bedecked phlox. Iris borers live in the overwintered foliage of German (bearded) iris, so that’s another one to cut down and remove. We rake and remove any debris around fruit trees, including ornamental crabapples and pears. Fruit trees, in particular, are prone to fungal diseases that can overwinter in debris. We remove any dry fruit from the trees; these “mummies” can also harbor fungus. Put away the pruning saw. We might remove dead wood this time of year, but we generally leave trees and shrubs strictly alone. We won’t start pruning these again until mid-winter at the earliest. We also stack wood into small piles in an out-of-the-way spot. These fallen branches and rotting logs provide yet another winter habitat for insects and other wildlife. With these strategies, you’ll create a garden that looks beautiful and interesting during the winter months, enhances plant health, and provides for wildlife. And you can look forward to watching the birds in your garden this winter! Gardening tips, right to your inbox. Enjoying the tips you read here? Get them in your mailbox once a month.